Along with Graph Databases, Microsoft has introduced the new MATCH function for querying them. Robert Sheldon explains how to use the new function. Microsoft incorporated the graph database in SQL Server 2017, providing a logical structure for storing and querying data sets that contain complex many-to-many or hierarchical relationships. The first article in this series introduced you to the basics of graph databases and described how to define node and edge tables and populate them with data. In this article, we turn to the querying side of the equation, with a focus on retrieving related data in multiple node tables. 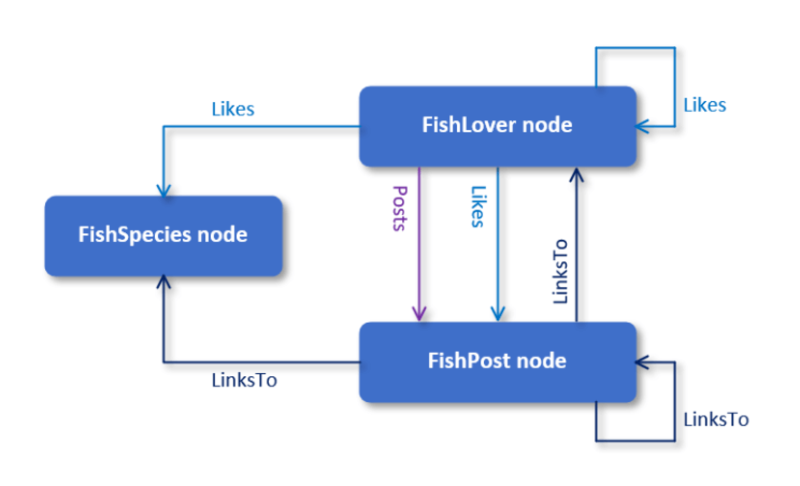 For the examples in this article, I used the FishGraph database from the first article in this series, except that I added more sample data. The database is based on a fictitious fish-lovers forum and includes three node tables (FishSpecies, FishLover, and FishPost) and three edge tables (Likes, Posts, and LinksTo). The following figure shows the data model used to build the database. The rectangles represent the nodes, and the arrows connecting the nodes represent the edges, with the arrows pointing in the direction of the relationships. 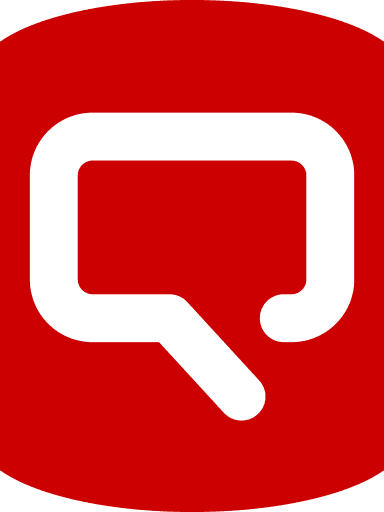 You can download the T-SQL script used to create and populate the database at the bottom of this article. As you can see, querying graph tables is a fairly straightforward process, especially when you take advantage of the graph column aliases. Of course, if you’re trying to retrieve data based on more complex relationships, the query itself also becomes more complex and can even get a bit unwieldy. For this reason, Microsoft has added the MATCH function for retrieving related data from graph tables. In either case, the search pattern indicates that the WHERE clause should return only those rows in which a relationship exists between node1 (the originating node) and node2 (the terminating node), as defined in the edge element. In the FROM clause, you simply list the participating tables – without the ON clause– providing table aliases where appropriate. You can then reference the aliases in the search pattern of the MATCH function. In this case, the search pattern defines the relationship fish lover likes a fish species. The statement will return the same results as those returned by the SELECT statement above. Again, the SELECT statement returns the same results as the previous two SELECT statements. The statement now returns the results shown in the following figure. As you can see, using the MATCH function to define a search pattern based on a single relationship is a fairly straightforward process. In many cases, however, you’ll want to return data based on multiple relationships, which is where the function can be particularly handy. For the SELECT statement to return a row, a fish lover must like a fish post and the fish post must link to a fish species. In this case, the statement returns only two rows, as shown in the following figure. By being able to link together multiple relationships, you can dig more deeply into how the nodes in a graph database are interconnected. For example, the preceding SELECT statement might help to determine whether users are more inclined to like a post that specifically links to a fish species. The first relationship (fish lover likes a fish species) is defined from left-to right, and the second relationship (fish post links to a fish species) is defined from right-to-left. As a result, the SELECT statement returns only those rows in which a fish species is both liked and linked to, giving us the results shown in the following figure. Because the Likes table is referenced twice within the search pattern, it must be included twice in the FROM clause, with a different alias assigned to each instance. The search pattern then uses these aliases when defining the three relationships (fish lover likes a fish post, fish post links to a fish species, and fish lover likes a fish species). The SELECT statement will return only those rows in which a fish species is both liked and linked to from a post that is liked, as shown in the following figure. The SELECT statement returns the same results as the preceding statement but simplifies the search pattern. In some cases, however, you might find that the AND operator makes it easier to read and troubleshoot your code as you heap on more and more relationships. To define the relationship in the search pattern, you must include two instances of the FishPost table in the FROM clause, assigning a different alias to each instance, similar to how you included multiple instances of the Likes edge table in the preceding two examples. The SELECT statement returns the results shown in the following figure. This time the FROM clause includes two instances of the FishLover table, with a unique alias assigned to each one, giving us the results shown in the following figure. The FROM clause now includes three instances of the FishLover table and two instances of the Likes table. The search pattern uses these instances to define the relationships fish lover1 likes fish lover2 and fish lover2 likes fish lover3, giving us the results shown in the following figure. The user hooked likes the users powerangler and deepdive. 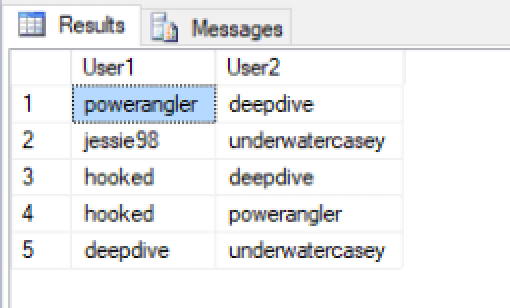 The user powerangler likes the user deepdive. 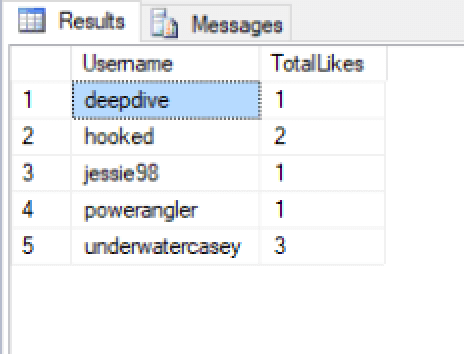 The user deepdive likes the user underwatercasey. Self-referencing queries make it easy to discover how data is related wherever it resides. Because the relationships are stored within the edge tables, it does not matter if the relationships cross multiple nodes, are contained within a single node, or are a combination of both. 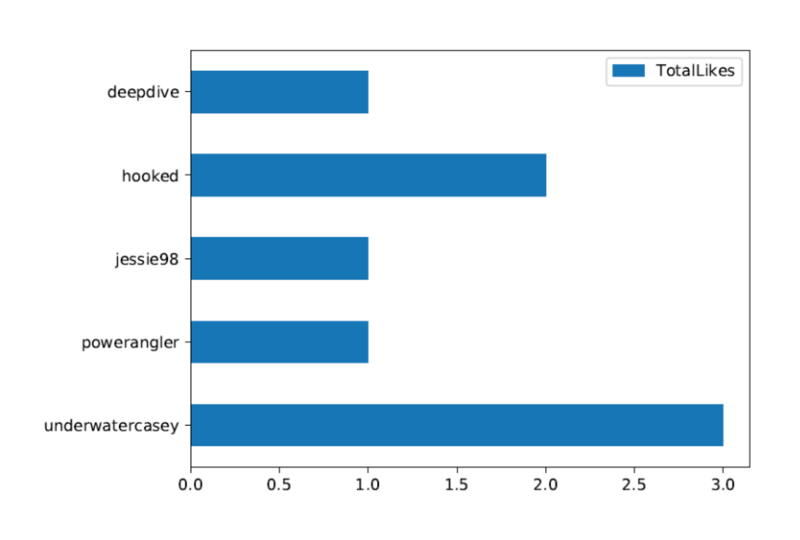 The GROUP BY clause groups the data by the Username values in the FishLover table in order to provide a count of total likes per user, as shown in the following results. Declares the @pscript variable and assigns the Python script to the variable. The script creates a data frame based on the data returned from the graph database and then generates a bar chart based on the data. Declares the @sqlscript variable and assigns the SELECT statement to the variable. This is the same SELECT statement shown in the previous example. Passes in the two variables as parameter values to the sp_execute_external_script stored procedure, which retrieves the graph data and runs the Python code. When you run the sp_execute_external_script stored procedure, the Python engine generates the bar chart shown in the following figure. As these examples demonstrate, graph databases have been well integrated into the SQL Server ecosystem, providing you with a great deal of flexibility for working with graph data. MLS in particular opens up a wide range of possibilities for analyzing and visualizing the data in a variety of ways. As with storing and populating graph tables, querying those tables is a relatively painless process, once you understand the fundamentals. Where applicable, you can use the MATCH function to streamline your queries. When that’s not practical, you can revert to regular queries to get the data you need. The only trick is to make sure you’re working against an instance of SQL Server 2017 and not an earlier version. Fortunately, you can download the Developer’s edition for free, which comes with all the features available to the Enterprise edition, including support for graph databases. You can then use what you learned so far in this series to start exploring graph databases on your own. Great article. I see some nice tricks here that I think our team is going to find useful. We’ve been working on building a graph proof of concept and so far the performance even at scale has been pretty good (700 million row edge tables, 50 million row node tables, etc) in comparison to a relational schema. We have noticed a few nuances with node and edge tables when using temp tables (I’m not saying this is necessarily a good use case when using node and edge tables) and when using the designer in SSMS (if the designer drops and recreates the table it’s not longer an edge or node table, tested with SSMS 17.5). It seems like there is still some work to be done from Microsoft to “fully” implement their graph features. I would say the core of their work so far has been good though and we’re looking forward to the v.Next features we’ve heard about. Nice article! I wonder how many people have had an undergrad course in graph theory? It’s one of those math tools that is incredibly powerful and full of incredible surprises, while being so fundamentally simple. I have mixed feelings about embedding graph commands into SQL. But I have really bad feelings about using the reserved word MATCH from the ANSI/ISO standard MERGE and assigning it another meaning. Why not PATH, a standard graph theory term? Initially I was excited about this, but on further examination the limitations of the query language are rather disappointing. Seems for now Neo4j is still the way to go, with their Cypher language, or perhaps checking out some of the other query languages is in order. Great Job, Robert! Thanks for putting all together! this is really helpful. I did a quick test following your tutorial. Everything went well. I have one NODE table called “airport” and one EDGE table called “passenger”. Basically, querying passenger volume will be from airport A to airport B. We had two relational databases table called “airport” and “passenger”. No changes for airport table between relational databases and graph database; removed two columns “fromairport” and “toairport” from EDGE table since Graph has $from_id and $to_id created automatically while i created EDGE table. Everything works, but the performance is not good enough. my results 421757 rows data took 7 sec on relational tables, but 12 sec on graph tables; BTW, i have “fromairport” and “toairport” as PK at relational table “passenger”. not sure if missing anything or any thoughts on my testing?